The U.S. has accused Huawei of using a Hong Kong shell company to sell equipment to Iran in violation of U.S. sanctions. It also says Meng and Huawei misled banks about the company’s business dealings in Iran. In urging the court to reject Meng’s bail request, prosecutor John Gibb-Carsley noted the Huawei executive has vast resources and a strong incentive to flee as she is facing fraud charges in the United States that could put her in prison for 30 years. David Martin, Meng’s lawyer, said Meng was willing to pay for a surveillance company to monitor her and wear an ankle monitor but she wanted to be able to travel around Vancouver and its suburbs. Scott Filer of Lions Gate Risk Management group said his company would make a citizen’s arrest if she breached bail conditions. Martin said Meng’s husband would put up both of their Vancouver homes plus $1 million Canadian for a total value of $15 million Canadian as collateral. The judge cast doubt on that proposal, saying Meng’s husband isn’t a resident of British Columbia — a requirement for him to act as a guarantor that his wife won’t flee — and his visitor visa expires in February. He said later that $15 million Canadian would be an appropriate amount if the judge granted bail, but he said half should be in cash. Meng’s arrest has fueled U.S.-China trade tensions at a time when the two countries are seeking to resolve a dispute over Beijing’s technology and industrial strategy. Both sides have sought to keep the issues separate, at least so far, but the arrest has roiled markets, with stock markets worldwide down again Monday. 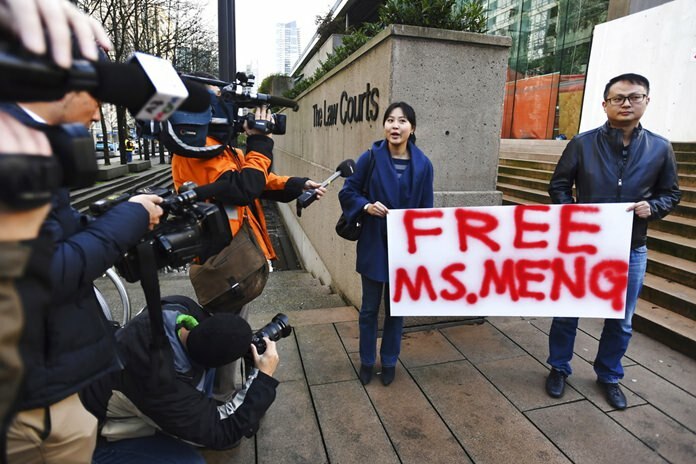 The Canadian province of British Columbia has already canceled a trade mission to China amid fears China could detain Canadians in retaliation for Meng’s detention. Stocks around the world fell Monday over investor concerns about the continuing U.S.-China trade dispute, as well as the cloud hanging over Brexit negotiations after Britain’s prime minister postponed a vote on her deal for Britain to quit the European Union. In the U.S., stocks were volatile, tumbling in the morning and then recovering in the afternoon. Bill Perry, a trade lawyer with Harris Bricken in Seattle, said China’s decelerating economy is putting pressure on Xi to make concessions before U.S. tariffs go up. Lu, the Foreign Ministry spokesman, accused countries he didn’t cite by name of hyping the “so-called” threat. Canadian officials have declined to comment on Chinese threats of retaliation, instead emphasizing the independence of Canada’s judiciary and the importance of Ottawa’s relationship with Beijing.